No, the thing I LOVE today is not George Washington....keep reading! OK, don,t laugh, but today one of the things I LOVE is trivia. Yesterday there was a section of trivia about the Presidents of the United States in the the paper. I was totally enthralled. I shared many of these fun facts with BD and he would raise his eyes from the sports section and mumble uh, oh, umm. I could tell he was totally bored with it all. I could not quit reading. I read a bit of trivia about each one of our 43 presidents. I realized that it was not just this bit of trivia, but, I really enjoy all kinds of useless information. I can't ever remember it later when maybe I could show my intelligence, or even be of help to anyone. But, for the moment that I am hearing it, I get a great deal of pleasure. 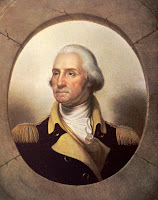 Did you know that George Washington was the only president to be unanimously elected and the only one who did not represent a political party? Did you know that Martin Van Buren, who was the 8th president, was the first president to be born in the U.S.? Or, did you know that our 31st president, Herbert Hoover, was the first one to be born west of the Mississippi River? Now this is fascinating stuff!!! So, if you know anything that is totally useless just let me hear it. I would love it, and then forget it just like I always do.